HURFOM: On November 4th 2018, Ah Soe, a 29-year-old man from Tha Byay Thit village, Ye Township, Mon State, was arrested by the Mon State Anti-Narcotic Task Force under the authority of Police Captain Kyaw San in Hnit Kayin village for possession of methamphetamine pills (yaba) purchased at the request of a friend. 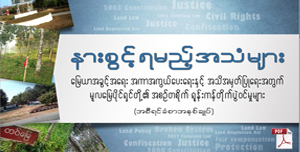 For nearly three months, Ah Soe has been remanded in Ye Police Station, as the Ye court cannot proceed with its investigation given that the plaintiff, Police Captain Kyaw San, has yet to appear before the court. On the day of the incident, Ah Soe had travelled to Hnit Kayin village to repair his motorbike where he was approached by his friend, Nai K—, and provided 25,000 kyat (US $16.46) to purchase yaba in nearby Ah Nin village, at Nai K—‘s request. “My husband’s friend wanted to use yaba and he asked my husband for help [obtaining yaba]. When my husband went to Ah Nin village to buy the pills, Nai K— phoned him and said to come back quickly as he was in a hurry. On his return, my husband was stopped between Ah Nin and Hnit Kayin by the Hnit Kayin village administrator and the police. My husband was found with six pills of yaba, and was then struck by police a number of times before he was arrested,” said Daw Mu Chit, Ah Soe’s wife. However, according to Ah Soe’s wife, one of the Anti-Narcotic Task Force officers present during her husband’s arrest was with Nai K— earlier that day when her husband agreed to purchase the drugs for Nai K—. “They gave the money to my husband to buy the drugs, and then they arrested him. They found only six pills on my husband, but in the police report they stated that they found 17 pills and some ice [crystal methamphetamine]. 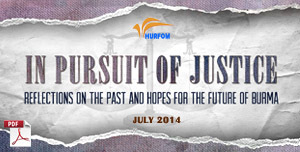 There is no justice,” his wife remarked. Daw Mu Chit attempted to contact Nai K— to ask that he testify before the court and inform the judge that Ah Soe had first been asked to purchase the drugs under the watch of a Task Force officer, and that the amount of drugs Ah Soe was carrying had been exaggerated in the police report, but was unable to do so because Nai K— reportedly fled to Thailand soon after the incident. 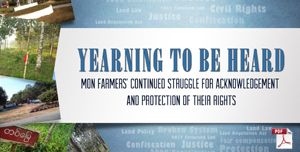 Apart from being unable to enlist the support of a key witness, ongoing delays with court proceedings have presented livelihood challenges, as Daw Mu Chit cannot regularly work due to weekly court appearances. “The court hearing is once a week, but the police officer always misses the appointment. We are present for the hearing every week, but the judge can’t proceed with the case because the police officer never appears before the court. They arrested my husband but never show their faces before the court as witnesses to the crime. Do they want to detain my husband forever? It’s costly for us to appear every week while the court fails to proceed with the case. It takes up valuable time, and we’re unable to go to work,” explained Daw Mu Chit. She continued that it was unacceptable for a police officer, who is also the plaintiff in the case, to repeatedly miss the scheduled hearings. “We want to know, in no uncertain terms, if my husband will be imprisoned or released. We don’t have much money…We want to go abroad for work…But because the case against my husband has stalled, we can’t go anywhere. We have to keep the court appointments. During today’s scheduled hearing, the judge phoned the police officer, but the officer said that he was unable to appear because he was in a training. As usual, we have to wait for another hearing. 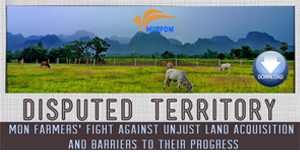 About three months have passed but nothing has happened,” stated Daw Mu Chit. 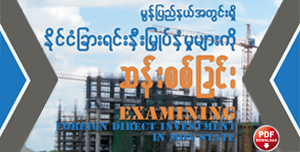 Daw Mu Chit filed a complaint with the Mon State Government Office in Mawlamyine and the Office of the Mon State Members of Parliament because of the ongoing delays with her husband’s case but has yet to receive a response. 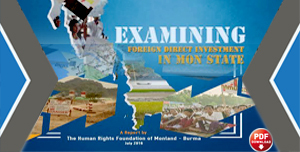 As reported by HURFOM, Mon State police have been known to fabricate drug charges, and both the police and judiciary have been accused of misconduct and corruption with respect to drug-related criminal activity. In 2018, activists again highlighted corruption and inaction on the part of police and village administrators for fueling the drug trade in Mon State. 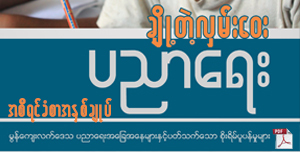 Taken together, repeated accusations of misconduct and corruption against village administrators, the police, and the judiciary underscore that the rule of law in Mon State is far from entrenched, affording civilians little protection before the law, and little guarantee that authorities will respect, protect, and fulfill their fundamental human rights.